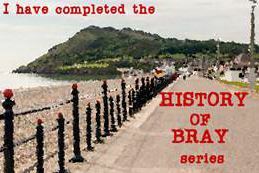 A History of Bray is a short series of caches intended to bring finders to historically important places in Bray. The Bray Head Inn (also known as the Crofton Bray Head and the Bray Head Hotel) has been a landmark in Bray for over 140 years. The BAFTA Award winning children's television series Custer's Last Stand-Up was also filmed here. The cache is a micro; please bring your own pen. This spot can be extremely busy, especially in good weather, so as always, try to look inconspicuous! There is ample parking nearby (look out for pay & display times) and the DART station is a 10-15 minute walk away. The previous cache that was here was the first cache I managed to find by myself, and now that the original cache has been archived, I hope that this one will be something of a tribute to it.